IDF General on northern front talks about Israel's aid to those wounded during fighting in Syria. When Brigadier General Yaniv Asor arrived two years ago to command the IDF’s Golan Division during the murderous fighting in Syria, he concluded that steps must be taken to aid both sides in the conflict. The IDF has been assisting the wounded in Syria in unprecedented numbers. Since the beginning of the fighting there, some 3,000 wounded have been treated in Israel, and about 1,000 children and their parents have been admitted for medical treatment. "Only yesterday, two children underwent cardiac surgery at the Sheba Medical Center, their operations funded by the Peres Center for Peace," Asor related. 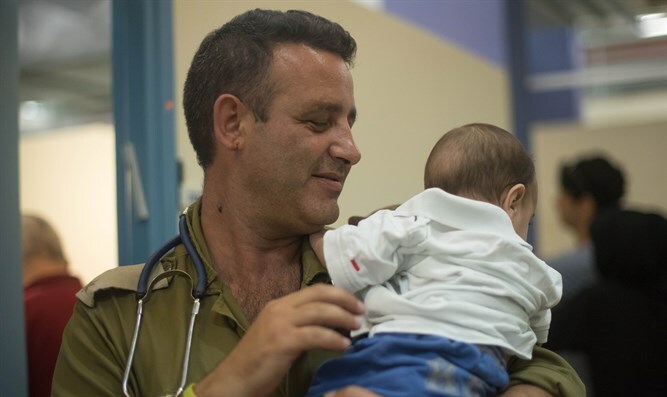 The commander of the "Good Neighbor" branch of the IDF responsible for providing aid to Syrians, Lt. Col. A., related that, after the IDF learned that a local clinic in Syria had been bombed, the defense establishment rushed to send a medical team with equipment to help those in need. Asor also said that "there was not a single terrorist attack from the area in which the rebels operate (where the locals are being held). This shows the importance of our work in cooperation with 'Good Neighbor'."